One word to sum it up: Adrenaline. Denzel Washington isn't usually my typical deal. Nor is a movie about a runaway train. The decision to watch Unstoppable only came after seeing the trailer before TRON: Legacy and an afternoon filled with nothing to do. I feel like that's what Unstoppable is perfect for: being an afternoon filler that is satisfying enough. I mean, it sure gets those bums on seats and mouths filled with popcorn and still have them reeling (in a good way), then Unstoppable succeeds in the almost impossible: being a worthy blockbuster. Due to human error, a train is set off at a speed which rises up to 70 miles an hour, without anyone controlling it. The coporation that own the train try everything to stop it, before another train coming in the oppostite direction collides with it. Luckily, that train escapes without harm, but as the train approaches closer to a town and threatens to cause a toxic explosion because of it's speed, there are barely any options left apart from to derail the train, consequently costing the company millions. 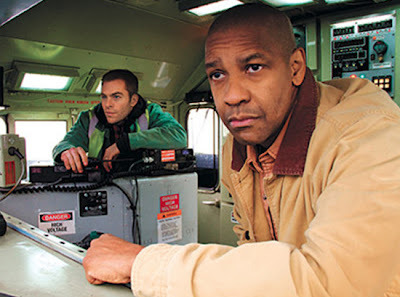 A veteran engineer (Denzel Washington) and a young conductor (Chris Pine) take it upon themselves to slow the train down enough to prevent it from destroying the town that awaits them. Give Tony Scott a camera, tell him he needs to direct an adrenaline filled ride which involves a train, and he will shake everything up. Literally. The camera work is as shaky as hell, and zooms in on stuff that doesn't need to be zoomed in on (Exhibit A: the camera zooming in and out like 50 times during a phone conversation between Denzel and his daughter). Sometimes it's a little off putting, but because of all the other stuff that is going on in the movie, it's not really so much of a problem. Unstoppable is tremendously entertaining, and it's hard to take your eyes away from the screen. After getting out of the cinema, it doesn't feel like you have just watched a movie. Instead, it feels like you've just witnessed exactly what this movie is, a runaway train and another train trying to stop it, basically without any of the movie strings attached. It's a weird experience, but it's also a very good one, thanks to it's intensity which pretty much reduced me to tears in the end. Sure, it won't win any awards, but who cares? When a movie can involve the audience in such away that you feel like you have an adrenaline rush sitting in a theatre, you know you're onto something good. It's just too exciting to ignore. THE VERDICT: An intensified thrill ride which is edge-of-your-seat stuff, and refuses to let go until the end.